Saul Flores, a photojournalist originally from Mexico walked over 5,000 miles across Latin America to support immigrants. Saul Flores, a photojournalist, graduate from North Carolina State and a migrant from Mexico, came to Lindenwood on Oct. 8 to talk about his 5,328-mile walk through Latin America. The event was hosted in the Library and Academic Resource Center theater by the Latino fraternity Alpha Psi Lambda for Hispanic Heritage Month. “The Walk of Immigrants” is a project Flores started in 2010, inspired by his mother and father, to raise awareness on Latin American immigrants and things they have to go through in order to get to the U.S.
Flores’s mother and father migrated from a small city in Mexico. His mother wanted her son to have a better life; for that reason, she decided to leave everything she loved behind and come to the U.S.
“My father was escaping war and my mother was escaping poverty,” Flores said in his speech. Flores and his family arrived in New York with little money and scant possessions. “We started at the very bottom,” Flores said. A girl from a school in Atencingo, Mexico named Emiliano Zapata during Saul Flores’s service when he was 18 years old. One of the most beautiful memories he said he has when growing up was a Saturday morning when his mom pulled him out of bed at 4 a.m. and took a subway to the city. “We ended up working at a women’s house named Margot and I remember my mom bleaching and scrubbing the floor and I felt some sting on my skin from the bleach,” Flores said. He said his mother worked her whole life, but was never rich. They just had enough money to buy food, but could not afford college for Flores. When he was a teenager he said he went to do service work in his mother’s hometown to learn about his heritage. He went to a school named Emiliano Zapata, a poverty-stricken school. The principal came up to the 18-year-old Flores and told him that he was really lucky that his mother migrated to the U.S. or else he would be sitting here in this school. The principal asked Flores to photograph the students here in this school and show his mother her community. Flores began to photograph “joy, despair, and innocence,” with intentions to show his mother once he went back home. “Photography is how I began to show my mother the world,” Flores said. 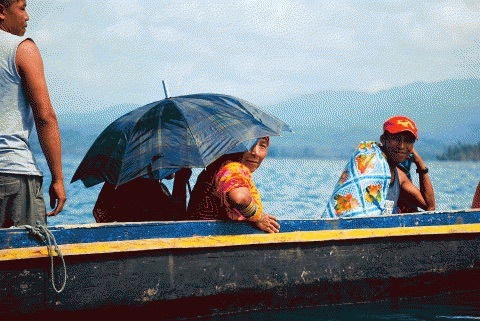 People in a canoe when he was brought to Panama during his journey on 2010. The way Latin American immigrants are portrayed in media was “horrible,” Flores said. The journey was “the most physical, mental, and emotional struggle in my life,” Flores said. He photographed Latin American people during his journey – to give Americans the glimpse of his community and to raise money for the elementary school in Atencingo, Mexico. Flores tried passing through the Colombian and Panamanian border by walking through the dangerous forest. He was caught by the Colombian army and was forced to go back to Colombia. While he was walking back to Colombia, he realized that one side of him was completely numb. Later, he learned that he was poisoned by a dart frog and had to recover. He woke up a few days later and was sitting at the border town, trying to figure out how he was going to go to Panama until a random man sitting in a log canoe showed up. Surprisingly, the man offered to take him to Panama by a small canoe. A Kuna Village, taken in the San Blas islands of Panama during Saul Flores’s journey in 2010. The man brought Flores to a beautiful village inhabited by the Kuna tribe, native indians in Panama, and Flores started to photograph it. “It was like a dream,” he said. He said he was really grateful that the man helped him. “I had learned that getting to know these people was a beautiful experience,” he said. Overall, this project made him realize how difficult the struggle was and how immigrants, like his mother and father, had to go through that and still are, just to have better lives.